Today we are releasing a new version of Deck Adventures Wild Arena with the brand new Endurance Mode! The Endurance Mode consists of 7 tiers of increasingly difficult battles. Players can try to get as far as possible and then choose to reset it every 24h. In Endurance mode each card can only be played in one battle. For each new battle the player has to build a deck and each card that was played during that battle is locked for the remaining battles, until the Endurance Mode is reset. Sometimes players may revive up to one card after a battle. Your progression as a player in the game will gradually increase the difficulty of the Endurance Mode, but at the same time, increase the quality of its rewards. With the one-time-use of all cards you will have to find a strategy that works best for you and that will take you as high as possible on the Endurance mode tier-ladder. Find the perfect strategy and collect the best rewards! We hope you enjoy it! You can now double-tap cards in the card collection screen to add or remove them from your active deck. 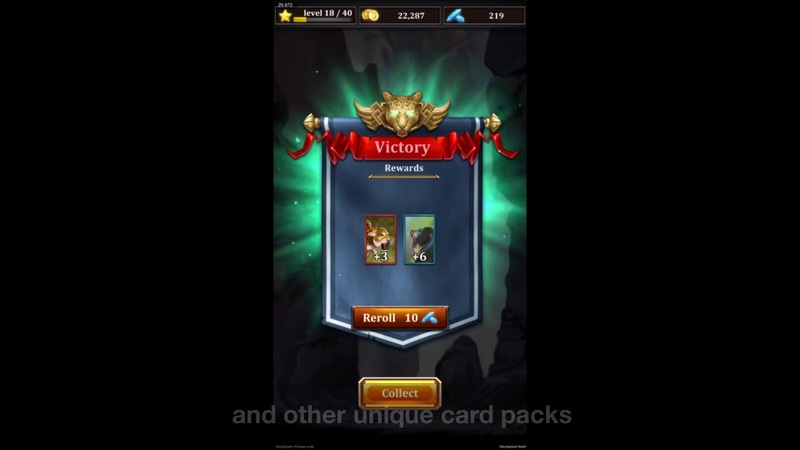 We enhanced the card upgrade view as well as the cardpack unpack screen. They look much better now. Some bug fixes and optimizations. As always leave your ideas and opinion in the comments below. We love to hear from you!